Local news: Agricultural Show results; Tiree Regatta results; Tiree architecture exhibition report; Feis Thiriodh 2009 report; request for new members of Tiree Rural Development; An Iodhlann’s article ‘Sheaves from the Stackyard’ about schools and staff; new recycling and refuse collection scheme – Tiree Environment and Recycling (TEAR); poem about Tiree by Joseph Thompson; news about the ferry service’s Road Equivalent Tariff (RET); PC Danny Lapsley receives Queen’s Police Medal at Holyrood; Stramash dinghy sailing courses schedule; notice about start of groundworks for the community turbine; RSPB news; new leaflet for responsible visitors; community Powerdown information about low-energy light bulbs; QMS Scottish Sheep Strategy Group open night and demonstration at Heylipol Farm; Mull Theatre play. Local news: report on the meeting to discuss the Crofters’ Reform Bill; article about Skerryvore’s debut at ‘T in the Park’; forthcoming launch of Skippinish’s live album; Michael Holliday’s article promoting a public event exhibiting Tiree building design; interview with Operations Director of Atlantic Edge Hotels which now runs both the Scarinish and Lodge hotels; opening of new guest house ‘Rockvale’ at Balephetrish; letters to the editor about a visitor’s perspective of island culture, Angus MacPhail’s interview for the Oban Times, and a drunk driving incident; invitation from Strathclyde Police for potential Special Constables to come forward; Job Centre visit to Tiree; RSPB news; corncrake in the office; article by Alan Reid MP; community Powerdown home energy check; responsible access to Tiree’s beaches; conserving water supplies; Tiree Regatta advertisement. Local news: Tiree Pipe Band wins Strathaven Gala shield; Feis Thiriodh 2009 schedule; Atlantic Rising project starts on Tiree; Tiree Community Broadband update; Tiree Open golf competition; Team Tiree moonwalk; Strathclyde police officials visit by helicopter; use of passing places by motorists; Baugh Church re-development project; funds raised by Tiree 10K events for Tiree Windsurfing Club; The Cooperative invests in Tiree food store; Saoghal nan Gaidheal / Life of the Gael 2009 – photographic competition for children to promote use of Gaelic; school news; local band Skerryvore prepare for their ‘T in the Park’ debut; Agricultural Show home industries schedule. 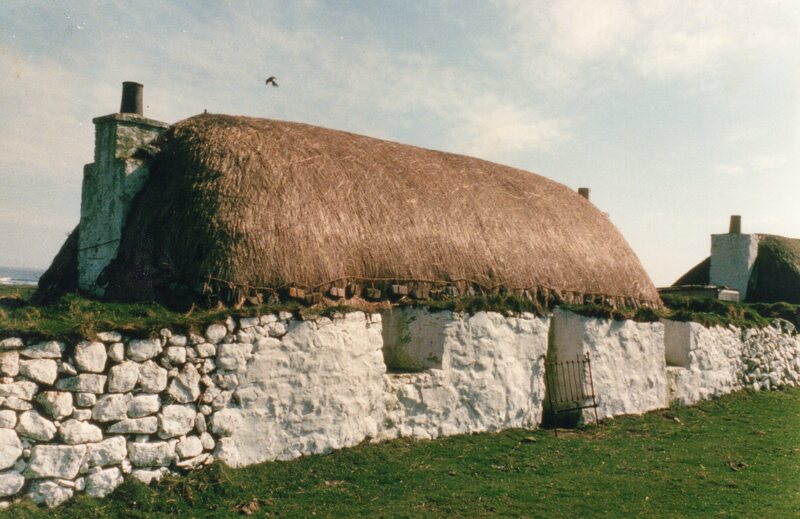 Colour photograph of the thatched house and barn at Kilmoluaig in 1988. Traditional haystacks are visible in the stackyard on the left. 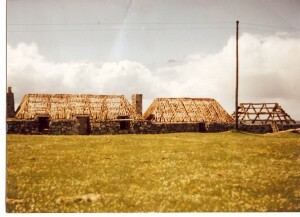 Colour photographs of the thatched houses at Sandaig in 1988. 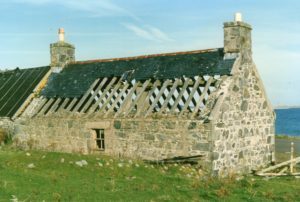 The row of houses and barns was renovated by the Hebridean Trust, using traditional marram grass, and opened to the public as a museum. It closed in 2010 and was sold into private ownership. 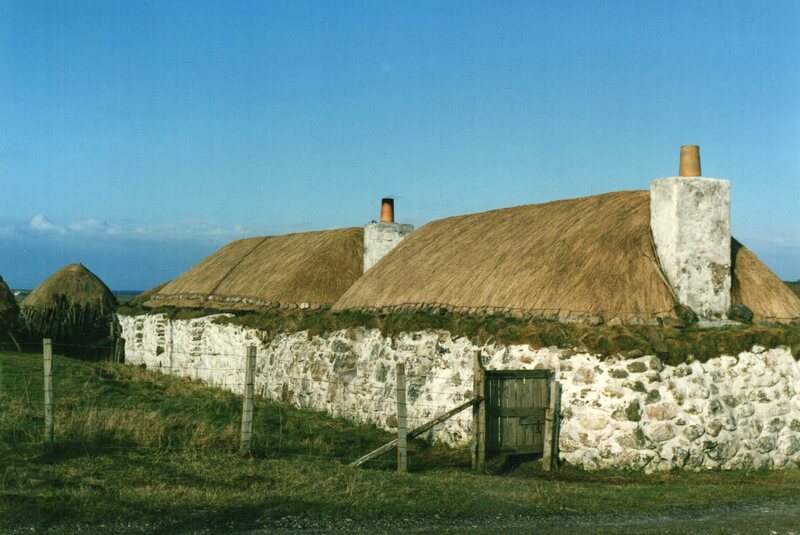 It has since been renovated again and the roofs replaced with reed thatch and black felt. Colour photograph of Alan Stevenson House, Hynish, before renovation in around 1990. 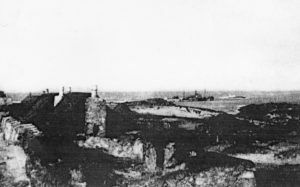 Black & white photograph of the home of Captain Lachlan MacPhail (1889-1961), at Clachan, from the shore in the 1930s. 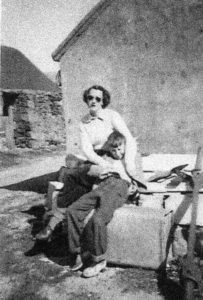 Black & white photograph of a daughter and grandson of Annie Cameron, Balevullin (ca 1880-1965), in front of the shed belonging to Neil McNeil, in around 1965. 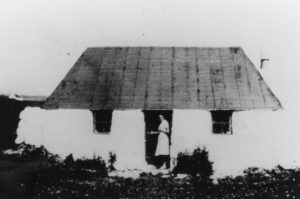 The shed was adjacent to Annie’s house, which is just visible on the left. Annie moved to Greenock when she was young, although her children and grandchildren spent summers in the house until it was sold and demolished in around 2003. 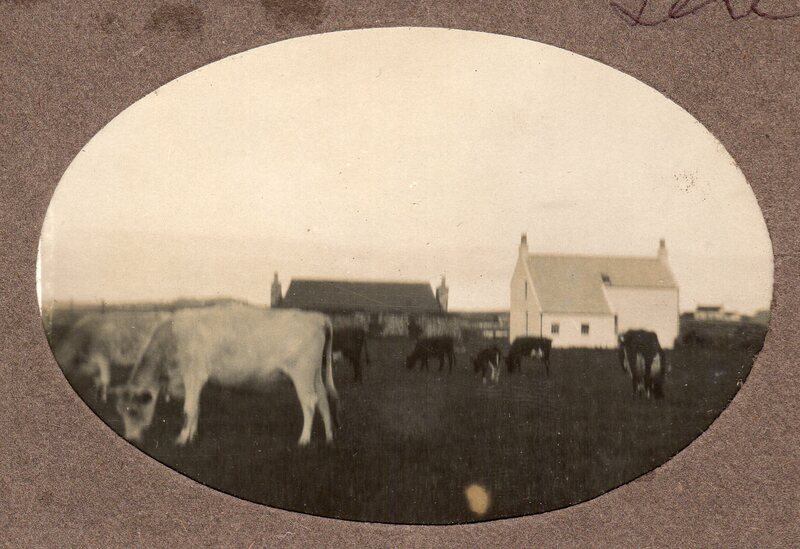 Colour photograph of the house of Annie Cameron, Balevullin (ca 1880-1965), from the east. 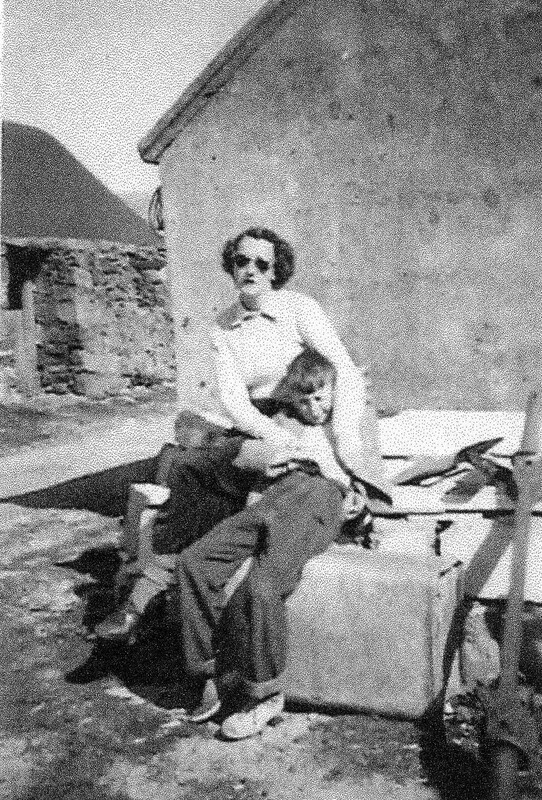 Annie moved to Greenock when she was young, although her children and grandchildren spent summers in the house until it was sold and demolished in around 2003. 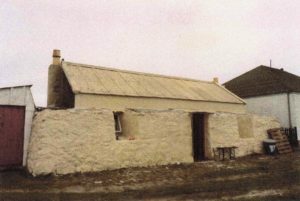 The roof was previously black tarred felt, the wriggly tin version being added in around the 1970-80s, along with the bathroom extension on the left.